Giving a spark of the first season’s apocalyptic excitement of The Walking Dead, this week’s episode “Inmates” reminded us of the desperation that made the early episodes so good. Now out of the prison, the survivors are separated and in search of a meaning to their very existence. Without the “comfort” of their makeshift home at the prison, and more importantly the quasi-society they had set up, they find themselves lost both literally and emotionally. Teamed up with unlikely travel companions the survivors search for something it may be impossible to find – a new home. First off we see Daryl (Norman Reedus) and Beth (Emily Kinney) on the run from a group of walkers and then in a search for their companions. It seems they have made Daryl a bit more standoffish and surly than he has been a while, which I think is a good thing. He hasn’t had a lot to do since the demise of Merle (Michael Rooker) and having him be so complacent was boring. Amping up the character of Beth, however, might not be such a good thing as I don’t think her character is very interesting (based on what we’ve seen so far). In a cool bit of non-linear storytelling we see Daryl and Beth following some clues as to the whereabouts of their friends, and then we cut to a flashback of Tyreese (Chad L. Coleman) to see how it all happened. 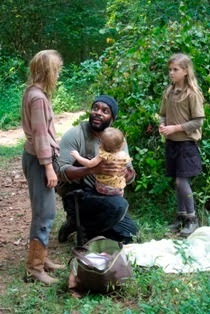 Tyreese is stuck with the young sisters Mika (Kyla Kenedy) and Lizzie (Brighton Sharbino) along with – surprise – baby Judith. I knew she wasn’t dead! It’s a relief she’s alive, but it becomes clear pretty quick that it’s unfortunate she’s ended up anywhere near burgeoning psychopath Lizzie. We already knew Lizzie was a little screwy, but now we know she’s got some real problems. It’s actually an interesting examination of what affect the “walking dead” would have on a child’s perception of life and death. So, while I thought it was super creepy that she nearly smothered the baby, I think the storyline has some real potential. Luckily Carol (Melissa McBride) turned up out of nowhere – a little too conveniently, but they spent no time with that – to provide some guidance to the girls. Lastly, and kind of least in my mind, we find out the fate of Maggie (Lauren Cohan), Sasha (Sonequa Martin-Green) and Glenn (Steven Yeun) – oh, and Bob (Lawrence Gilliard Jr.), but I haven’t started to care about him yet. Maggie is with Sasha and Bob, with Glenn nowhere to be found at first. She irrationally insists that Glenn has to be found and risks everyone’s lives to do it – granted she told them she could go on her own, but rather than separation the other two join her. So we find out the school bus is full of walkers, but still no Glenn. As it turns out, Glenn is back at the prison, regaining consciousness, and he has no idea what went down with the Governor (David Morrissey) and Hershel (Scott Wilson). This is where things start to get really good. As he stumbles his way, in full riot gear, through a horde of walkers he discovers one other survivor. 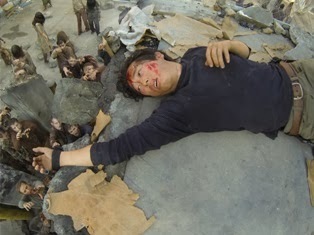 It’s Tara – sister of the Governor’s girlfriend – and Glenn is also unaware of her involvement in the massacre. Nonetheless the two are stuck with each other. At the very least Tara feels guilty about what happened. So, we get two cliffhanger endings in one episode, which is two more than last week’s. Glenn and Tara defeat a group of walkers only to be captured by some mean looking dudes in army vehicles. Could this be a Governor-type situation all over again? Meanwhile, Carol, Tyreese and the children stumble across a mysterious sign that says salvation is just a ways down the railroad tracks in a place called Terminus. I don’t know about you, but Terminus doesn’t sound like all that friendly of a word, but I’m dying to find out what it means. 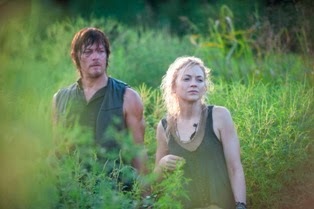 And we know Daryl and Beth can’t be far behind, so I’m thinking that group will meet up again. I don’t really know how everyone left the prison and Rick (Andrew Lincoln), Carl (Chandler Riggs) and Michonne (Danai Gurira) ended up in suburbia, while the others seem to be in the middle of nowhere, but I guess they must have went in opposite directions. One thing that’s for certain: Rick is no longer the leader of anyone, which leaves things wide open to move in a new direction. That’s exactly what this series needs.